An inspiring gift of tradition. 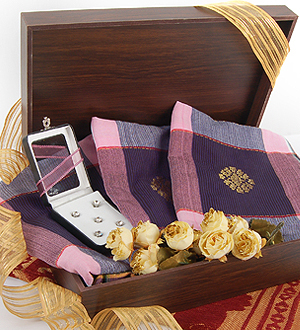 Traditionally hand made Samping Kain Tenun with a complementing crystal brooch (Butang Baju Melayu) presented in a Karaf handmade keepsake wooden box. Note : Each piece of our Kain Tenun are individually unique and available in different colors and designs. Kain Tenun Bunga Tabur is an ideal gift for Birthday, Anniversary, Housewarming, to Congratulate or simply to say 'Thank You', 'I'm Sorry', 'Well Done' or "Be Happy".